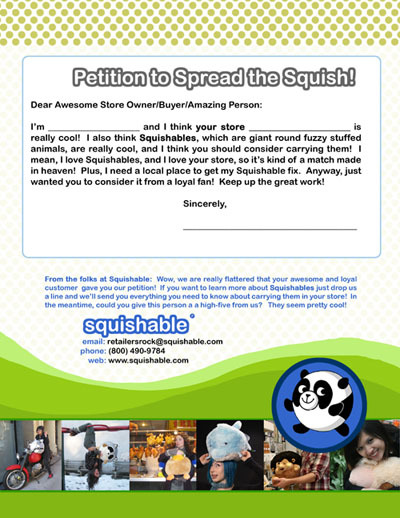 Petition a Store to Extend the Squish! A lot of the emails we get go something like this: "I big heart Squishables and I also big heart a certain toy store/comic book store/gift shop/circus near me. Squishables plus store would make me happy!" Download the petition and get your friends, enemies and household pets to sign it. The more folks on the peition, the more likely to get noticed, but even a single signature helps! March into the store you big heart and hand that petition to that gal or guy behind the counter. While you're at it, you might want to give them a high five and let them know they're doing a teriffic job. They work hard! Success! You have delivered your message of Squishy Squishy hope, and hopefully the word will be heard! And be sure to let us know if you do undertake a Mission of Squish over on our Facebook page so that everyone can cheer on your amazing and laudable efforts to make the world a more adorable place!